The consensus is that trigger points cause pain more often than any other condition and are drastically under-diagnosed due to lack of information. Trigger points are specific, hyper-irritable and hypersensitive areas in muscle that suffer from decreased circulation, increased contraction and spasm. 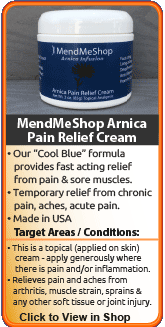 Lack of circulation creates a high anomaly of toxins and increased nerve sensitivity that can range from low ache to sharp pain. Now just because the trigger point causes the pain does not mean that the spot is painful itself. When the pain causing spot is painful, it is called a primary trigger point. 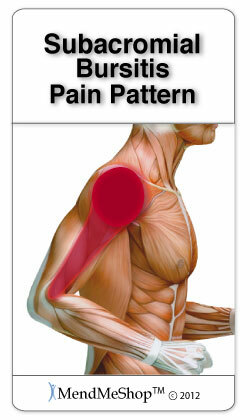 However, pain can also manifest itself in areas away from the active trigger point - such pain is called referred pain. A significant trigger point nodule can often be noticed as a small lump in the muscle, usually no larger than a pea. Less substantial trigger points are not so noticeable by a lump, but are easy to find anyway - just search your own muscles for the spots that feel most tender; they will transmit pain pain when you press on them. You may not be able to locate a trigger point by feel, but it will always hurt when you press on it. Healthy muscle fiber is neither contracted nor stretched when at rest. When contracted the muscle fiber is closer together and when stretched, it's further apart. 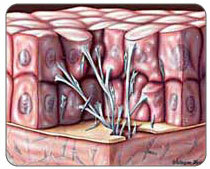 In a muscle that is causing trigger point pain, the fiber develops a knot and is in a constant state of contraction. The fiber around these knots is stretched by the excess tension and the muscle fibers become tighter. With the continuous contraction, blood flow is slowed to a stop in the trigger point area and essential oxygen and nutrients are prevented from reaching the muscle tissue. Toxins and waste build up in the muscle and you will experience pain, tension, irritation, and spasm. Find the location of the trigger points that are the source of your shoulder problem. Eliminate these trigger points as soon as possible, to escape the downward spiral toward continually worsening shoulder mobility. Within the physical therapy arena, one of the classic resources for Kinesiology (the study of movement and the way muscles cause movement to occur) reference is Brunnstrom's Clinical Kinesiology (Smith, Weiss, and Lehmkuhl 1996); much of the following information on this page will stem from this book. Though much of Kinesiology is focused on movement, it is also concerned with the myriad of factors that limit the function of muscles. Trigger Points often cause muscle weakness. Trigger Points often are painful -> This pain makes muscles stay tense -> This constant tension in the muscle will make the trigger point worse, thus completing a continually worsening cycle. The reality about rotator cuff injuries is that they often start slowly and gradually worsen to the point where the pain from the injury reduces your range of motion, eventually "freezing up" the shoulder joint. Once the shoulder is immobile, adhesions start to develop essentially locking your shoulder into place. In the opinion of some doctors* the first step in treatment is to get rid of the trigger points that reside within the muscles associated with the problem shoulder. The sooner the trigger points are treated, the better chance there is to keep adhesions forming in the shoulder joint. *Travell, J., and D. Simons. 1983. Myofascial Pain and Dysfunction: The Trigger Point Manual. Vol. 1. Baltimore: Williams and Wilkins. Stretching of tissue in the presence of heat would be especially valuable in working with ligaments, joint capsules, tendons, fasciae, and synovium that have become scarred, thickened, or contracted. Such stretching at 45 degrees Celsius caused much less weakening in stretched tissues for a given elongation than a similar elongation produced at normal tissue temperatures. Your massage therapist can certainly help with trigger point massage, but if you are treating your shoulder at home with the Shoulder T•Shellz Wrap® multiple times per day, you have a greatly improved chance of getting rid of your trigger points (and subsequently increase the range of motion in your shoulder). In some situations, trigger points in the back could be the cause of shoulder immobility; if you are certain that the underlying problem is in the upper back area, your trigger points are more effectively treated through the use of the Back T•Shellz Wrap®. A stretching routine can undoubtedly lead to a successful outcome for many patients. However, there are time that many people in pain simply cannot tolerate stretching. When pain levels are high and your muscles are too taut, stretching may actually aggravate your injury. In cases such as this, the smart way to go is to first minimize your pain using trigger point massage and T•Shellz Wrap® home treatments until you can reach a point where you start some moderate stretching without the pain. If you find the stretching aggravates the problem, stop stretching and just continue with the massage and T•Shellz Wrap® treatments. Combined with a stretching routine, the Shoulder TShellz Wrap is a highly effective treatment product for trigger points. Successful treatment of your trigger points will increase shoulder range of motion and reduce the likelihood of a worsening rotator cuff injury. However, know that no amount of treatment will help with complete detachment cases of rotator cuff tears. If muscles or tendons are severed, a Cold Compress or Ice Pack and TShellz Wrap can help manage your pain and inflammation, but surgery will be required for recovery. Reduced circulation in trigger points will eventually lead to muscle shortening and restricted movement which further accentuates the pain, thus completing a cycle of decreased mobility and further pain. This commonly becomes the underlying cause of adhesive capsulitis, chronic shoulder immobility and even chronic headache pain. The patient will typically continue to suffer from these ailments for long periods until the problem trigger points are treated directly. Mild Trigger Points can be addressed sometimes through massage and some sufferers maintain that acupuncture treats these problems as well, though it is not accepted by many medical institutions. Permanent removal of chronic trigger points and conditions caused by this (headaches, lack of flexibility in shoulders and neck, upper back pain, etc.) typically requires treatment using massage and Deep Tissue Therapy. 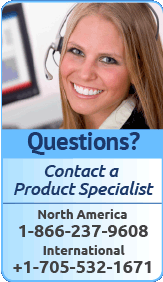 Treating Trigger Point Pain - What You Can Do! 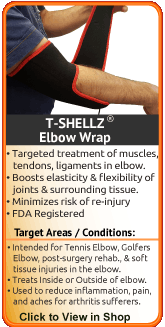 If you have shoulder and rotator cuff pain caused by tense, constricted muscles - use a T•Shellz Wrap® for your trigger points. Trigger point pain is caused by constricted muscle fibers that form knots, and eventually cause a buildup of toxins in the area. The trick to getting rid of this pain is loosening the knots to release the constricted muscle fibers. This will allow blood to flow through the fibers once again, bringing the vital oxygen and nutrients required for healthy tissue. An effective and pain-free way to loosen the knots is via Deep Tissue Regeneration Therapy through use of a TShellz Wrap. In addition, you want to get your muscle tissue back in the best possible condition you can. To do this, it is important to treat the scar tissue that forms in the muscle when the damaged tissue begins to heal - something our Deep Tissue Therapy wraps are great at! Even with optimum healing, there is always less elasticity in previously injured muscles fibers. However, if you heal your trigger point pain properly and treat scar tissue build up, your chance of chronic trigger point pain and shoulder conditions later on is much lower than average. We have healing tools that can help treat your rotator cuff muscle trigger point pain and speed up the healing process so you can get back to a life without further trigger point pain. 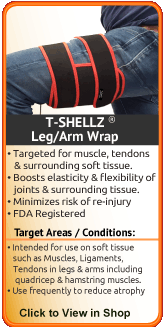 Our T•Shellz Wraps will loosen trigger points knots, treat scar tissue, and promote blood flow to loosen constricted muscles and heal the fibers faster and more completely than other home treatment methods available. 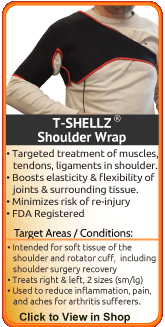 Click here to read more about how the Shoulder TShellz Wrap helps your body heal. If you would like to learn more about trigger points and their relation to the rotator cuff and general shoulder joint immobility, then do not hesitate to contact a AidMyRotatorCuff Advisor immediately by phone or email.